Among Paolo Giustiniani’s papers there is a dossier which contains some annotations against contemporary “false prophets”. The draft of a letter addressed to three Florentine ladies, Gabriele Biondo’s followers, are the subject of this study, that aims to show the various outcomes of the religious tensions that led both Giustiniani and Biondo to choose a secluded life on the Tuscan Appennine. While the hermit was committed in an extended reform of the entire Christianity, Biondo was the spiritual guide of a group focused on an interior and hidden religion, waiting for the final renovatio. Along with women’s participation, the occult character of such a devotion brought Giustiniani to identify it as a particularly dangerous heresy. Nella biblioteca umanistica di Ariosto: un nuovo somnium per Furioso XXXIV-XXXV? According to Pio Rajna and later scholars of the Furioso, the presence of St. John the Evangelist as a guardian of the terrestrial paradise and guide of a mortal visitor in the Otherworld did not have a literary precedent. On the contrary, St. John holds the very same diegetical function in the dialogue de somnio quodam, written a few decades before by the humanist Enea Silvio Piccolomini. An intertextual comparison between the two texts suggests Ariosto’s possible knowledge of the humanistic dialogue. Moreover Piccolomini’s dialogue belongs to the same genre and shares the same title of a well known hypo-text of Astolfo’s lunar journey: Leon Battista Alberti’s “intercoenalis” somnium. As has been observed, Edmund Campion’s Letter to the Privy Council contributed to turn the 1580 Jesuit mission to England into a public challenge to the Elizabethan government. Yet it can be argued that the challenge was fundamentally theological and not meant to undermine either the authority or the legitimacy of the regime. By focusing on the Anglican confutation printed in 1581 by Dr Meredith Hanmer, this essay will discuss the context of the dispute and analyse how the text carved the image of the mission as an act of political subversion. Interestingly, moreover, while it popularised the Letter as a «brag and challenge», Hanmer’s confutation was the first work to ever circulate it in print. The article offers an analysis of the Mistico Tempio del Rosario (1584) written by the Dominican friar Reginaldo Spadoni, followed by the commented edition of some poetic texts included therein. The Mistico Tempio is an interesting example of how the traditional topos of the ‘temple’ can be adapted to a spiritual context at the end of the 16th century. In addition, Spadoni’s work is useful to improve our knowledge of some important aspects of Renaissance religious culture, such as the Marian devotion, with special reference to the Rosary; the fortune of Solomon’s Temple and its relationship with the Virgin Mary; the devotional practices of the Dominican Order; the synergy between words and images and the use of mnemonics in order to communicate more effectively the spiritual message. This essay analyzes epistolary writings in Latin of three prominent figures in early seventeenth-century Lombardy (Italy): Girolamo Bossi, Aquilino Coppini and Sigismondo Boldoni. Starting in 1613, Bossi and Coppini published collections of letters emulating the Classical tradition established by the masters of the local ancient Roman Gymnasium (‘Scuole Palatine’); not so Boldoni, whose letters were published only in 1651, by his brother Ottavio. Before dying of the plague in 1630, at the age of thirty-three, Boldoni had already written a polished poem in ottava rima, and had subsequently achieved fame with his Laurus (1617), an elegant prose in Latin devoted to his native Lake Como. New contexts of use and archival material have been taken into account in the recent revaluation of the status of the Italian language before Unification. Among these contexts, the epistolary networks within the Catholic missionary Church represent an invaluable but still little investigated domain of Italian usage in the 19th century. This paper focuses on the letters that Rosendo Salvado, the Spanish founder of the New Norcia mission in Western Australia, sent in Italian to the Congregation for the Evangelization of Peoples in Rome between 1849 and 1860. While confirming the role of this language in the international communications of the Catholic clergy, these letters bring new evidence to research on 19th century non-literary written Italian. In this paper we analyze a travelogue about Montenegro based on a visit by the author, a member of the Italian parliament, named Alfredo Serristori, during the Turkish-Montenegrin War of 1876-1878. We have tried to highlight the historical, political and cultural context in order to determine the factors that influenced the image of Montenegro and of the Montenegrins in his work. Basing our analysis on the models of interpretation used by those scholars who dealt with travel literature about Balkan countries in general, we have referenced the source of the discourse that was embraced not only by Serristori, but also by other foreign authors who wrote about Montenegro during the Great Eastern Crises. Rejection of war and preservation of peace constitute an important theme in the work of the very significant Russian writer and religious philosopher Dmitry Merezhkovsky (1865-1941). Merezhkovsky’s attitude towards the war was shaped by Russia’s defeat in the conflict with Japan (1904-1905) and by the first Russian revolution of 1905-1907. His anti-war views were consolidated during the First World War and were based on his ideas of metaphysical connection between the war and the revolutionary exit of it. The philosopher hoped that a spiritual purification would be the result for the ‘philistine’, ‘positivist’ Europe from the war and for the Russia from the February democratic revolution of 1917, but this hope was destroyed by the October Bolshevik revolution and the subsequent emigration. G. Todeschini, La banca e il ghetto. Una storia italiana (secoli XIV-XVI) (G. Bartolucci), p. 705 – Renaissance-Humanismus. Lexikon zur Antikerezeption, hrsg. von M. Landfester (F. Della Schiava), p. 708 – Giovanni Garzoni, De eruditione principum. De principis officio, introd. ed ed. 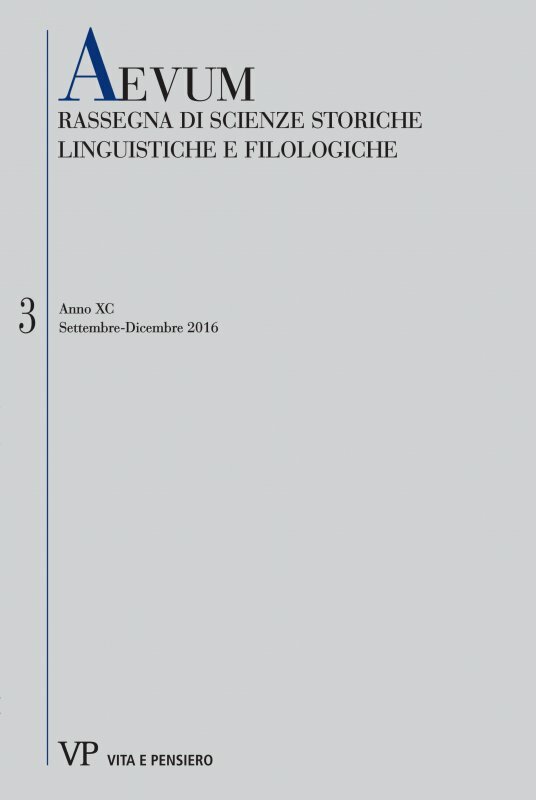 critica a c. di A. Mantovani (M. Lodone), p. 710 – Enea Silvio Piccolomini, Libellus dialogorum, a c. di S. Iaria (F. Toscano), p. 713 – A. Severi, Filippo Beroaldo il Vecchio un maestro per l’Europa. Da commentatore di classici a classico moderno (1481-1550) (A. Piacentini), p. 715 – S. dei Conti da Foligno, Le storie de’ suoi tempi dal 1475 al 1510 (M. Lodone), p. 717 – F. Lucioli, Jacopo Sadoleto umanista e poeta, con l’edizione dei carmi tradotti da E. Spangenberg Yanes (G. Vagni), p. 718 – G. Stein, Sir Thomas Elyot as Lexicographer (G. Iamartino), p. 720 – M. Rospocher, Il papa guerriero. Giulio II nello spazio pubblico europeo (I. Fosi), p. 722 – M. Firpo, Juan de Valdés and the Italian Reformation, translated by R. Bates; M. Firpo, Juan de Valdés e la Riforma nell’Italia del Cinquecento (S. Peyronel Rambaldi), p. 725 – E. Giazzi, Cultura e liturgia a Cremona tra Medioevo e Umanesimo. I frammenti del fondo ‘Notarile’ dell’Archivio di Stato (E. Fumagalli), p. 728 – L. Mazzoni, Fra Dante, Petrarca, Boccaccio e studi eruditi. Carteggio Giovanni Iacopo Dionisi-Bartolomeo Perazzini (A. Piacentini), p. 729 – T. Lentz, Les vingt jours de Fontainebleau. La première abdication de Napoléon: 31 mars-20 avril 1814 (R. Benzoni), p. 732 – R. Bass o, Levatrici. L’assistenza ostetrica nell’Italia liberale (F. Terraccia), p. 734 – R. Avesani, Per doverosa memoria: Campana, Battelli, Billanovich, Kristeller e altri amici (M. Ferrari), p. 736.